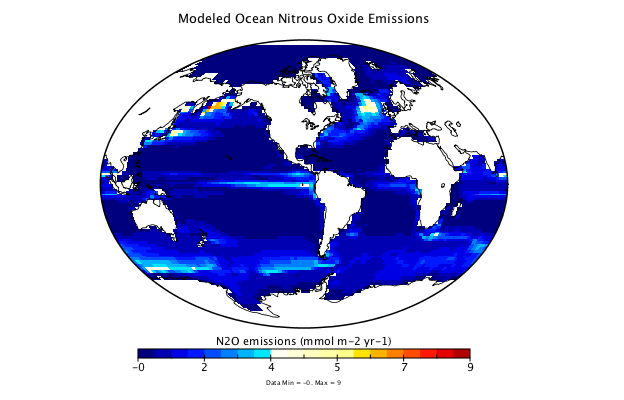 Currently, processes affecting nitrous oxide (N2O) levels in the ocean are poorly constrained. This uncertainty negatively affects the reliability of greenhouse gas emission models that are the basis for assessments such as IPCC, making it more difficult to predict future interactions between the ocean and climate. That’s why SOPRAN has funded our group to assess marine N2O dynamics. Using observations, our work focuses on describing how N2O is produced and consumed, primarily in low O2 environments. Model evaluations also provide insight on the spatial distribution of marine N2O and its sensitivity to predicted changes in ocean oxygen content and circulation caused by climate and global change.